Hi Community! I'll maintain a list here of content that I've established is compatible with the Omni. This is far from comprehensive of course, but as I try more I'll add them to the list. @SutekiB - did something happen to Joystick emulation? I still haven't been able to get that X360CE program to work properly, but I'd still rather keep trying to get that or some alternative to work than not have analog movement. It's bad enough not having decoupled movement, I dread the idea of Omni navigation being reduced to less than 4 bits. @GreyAcumen No, as far as I'm aware it still works, it's just that X360CE is quite complicated to set up, can't be used with every game, and sometimes it conflicts with what I want to do. For instance, it requires the game to be in gamepad mode, and VorpX may need the game to be in K&M mode for head-tracking to work. Keyboard emulation is much easier, quicker, and more reliable so I always go with that. While I'd prefer analogue speed, some games let you adjust the character speed so you can still get very natural feeling locomotion. In Doom 3 BFG for instance I was able to set different speeds for both walking and running, and remap the actions on the Vive controllers so all I have to do is squeeze the grip when I want to run. Xpadder takes your controller input and allows you to emulate a mouse and keyboard with it. So lets say I wanted to play a sticktly keyboard and mouse game with a controller, World of Warcraft. I would plug in my controller, start up xpadder and set up a profile to map my controller. So if I pressed forward on my gamepad xpadder would translate it as W and I would walk forward in the game or if I pressed left on my other analog stick it would rotate the camera left. So have you guys used xpadder? Or with the Omni can I also just emulate a keyboardas well? It would be nice if I can just map the omni to emulate whatever keys I wanted. And before you shoot me down with a 'This is a bad idea because VR sickness.' I am immune. I've tried to get sick and at best I've only gotten dizzy momentarily. This includes using trackpad movement to go one way while walking in a different direction. Or pressing the trackpad to rotate one way and rotating the other in the real world. Hi @Xain, the Omni can output a so-called 'standard' joystick, in the DirectInput format. While it works with mobile games, most games designed for PC only support the 'XInput' format since they're designed to be played specifically with the Xbox 360 gamepad. This is why you need X360CE if you want the Omni to emulate a joystick in PC legacy games - X360CE converts the output received into XInput format. Yes, you can use Xpadder to map WASD keys to a gamepad's analogue stick to play a game in Keyboard & Mouse mode. You don't technically need Xpadder for the Omni as it already outputs WASD if you select 'Keyboard Mode' in Omni Connect (the included software application); but since you will want / need to play the game in K&M mode, you will likely need to assign the game's action key-bindings to a gamepad (since you're unlikely to use a physical keyboard together with the Omni) - so I almost always use Xpadder for legacy games. Note that the Omni is recognised by Xpadder as a gamepad, so you could theoretically map another action to each movement by assigning keyboard keys to each of the four directions. I haven't found a use for that yet though. @Xain - You can set the Omni to keyboard mode so that it natively sends the respective 'wasd' button presses that would approximate your movement as you run on it. If you've ever played a game that properly supports analog movement and compared it to using xpadder to make your joystick activate wasd keys, then you are probably are already aware of the unnatural stop/start motion that comes from using keys to handle would could be variable speed movement. It works, but it's incredibly immersion breaking. However when set in standard mode, the omni is recognized (I think) as some sort of non-xinput gamepad/joystick. The problem with this is that it is recognized as a SEPARATE gamepad from the 360/PS4/XB1 gamepad you may already be using. So while you can use left analog to move your character, the omni would essentially control the movement for a theoretical player 2, and not do the character controlled with the gamepad any good. X360CE is a program that I believe was originally designed so that people could play games like GTA4/5 with a steering wheel for when they got in a car, and then back to a gamepad when not in a vehicle. It does this by acting as a middleman that looks for ALL inputs from any gamepads or whatever, and then allows you to mix and match the controls together and send on the new input to the game itself. That's the theory anyway. I'm not sure if it's the specific program I'm using, or because I'm using a PS4 gamepad that emulates a 360 controller instead of a real 360/xb1 controller, but either way has thus far resulted in nothing useful for any of the games I've been trying to get the omni to work with. Now that I've got a Vive system, I'm going to try to jump back into the fray though. Outstanding, I should have no problems getting everything to work then. Thanks guys. I am really looking foreword to trying The vanishing of Ethan Carter. @xxann5 - I have VoEC VR, so I'll add it to my todo list for Vive games to try out. When I tried VoEC VR, it only supported gamepad input, not keyboard input - that is very unusual. Apparently they removed it from the game (because the non-VR version has it) due to the best practice guidelines issued by Oculus. Unfortunately this affected the Vive version as well. It seems rather needless to me. Just because someone might find it hard to locate the keys while wearing a headset doesn't mean a developer should have to remove support for that device - especially if they have optional support for a gamepad in place. Maybe they have re-introduced it since I last tried. If so, please let me know as I would love to try it with the Omni! I agree @sutekiB It was pointless for them to remove it, its just fucks people that want to use it and the people that want to use a controller dont even realize the keyboard functionality was removed. It looks like it locks to whatever controller was used to start the game. I was attempting. I was trying to get this to work with vJoy and UJR but I could not get the Omni to bind to UJR. The Omni was set to gamepad mode but i could not get it to do anything. Any ideas @sutekiB ? Hey @xxann5 I tried X360CE and it didn't work for VoEC. Frustrating since it's a good looking game. Fortunately, lots of great legacy games out there. The older ones run especially well, like Doom 3 and Star Wars Jedi Knight - I'd love for someone to add Vive controller support for that series. The Vivecraft mod is also excellent. I did try a build of a new game yesterday that is using the SDK, and that was really good. I can't talk about it though! Well, in lieu of having already verified any actual games, I'll just list out what I did buy for this Christmas sale. So far most of my time has been taken up just playing Altspace and The Lab, and a few free demos. I also already have other gems, like Vanishing of Ethan Carter, Windlands, Virtual Desktop (ESSENTIAL for VR), and several other demos and free VR games. So yeah, I basically burned around $200 to get $220 steam gift cards (Target had a BOGO10%off+redcard5%off), and then I got probably around $300 worth of VR games. I also found several other free VR games that I added to my wishlist so I could find again to try out later. Production update today says: "We are currently working with more than twenty top-tier VR game developers who are using our Omni SDK"
Can we know who these devs are without waiting a month between highlighting one dev at a time? 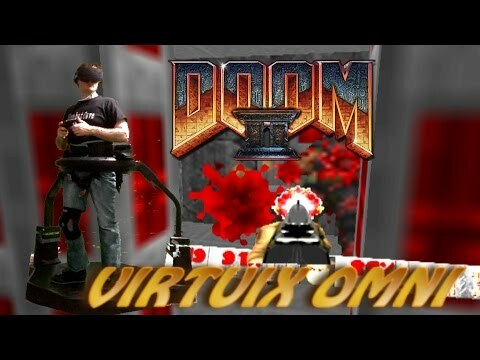 Assuming the Omni SDK is in a reasonable state (and I've already verified it should be possible on the OpenVR side), once I receive my Omni I plan to create an OpenVR plugin that supports the Omni in Vive games. I've tested against a few games and determined that most relevant ones should allow free movement. That will instantly create a huge game library. I am order 8179, so prob a while to wait tho! As you probably already know, the Unity and UE4 sdk's are right here http://www.virtuix.com/resource-center/ I'd be willing to test anything you compile. There should definitely be an Omni label, but I'm not sure it would go in the Play Area section. Omni use is still technically standing area. It should really be under input devices, for any game that supports the SDK. I agree, has anyone at Virtuix actually started talks with Valve/Steam to get that label added yet? It won't add itself someone will have to reach out and convince them that it's worth their time to add for the sake of the VR community. Added Dreadhalls. Features decoupled via the left Vive controller heading. Works great in keyboard mode! Can you update the list to have a few games that have OMNI tag, all the one's listed only have KB emulation support. Other than TRAVR and Omni arena what games have native support? You are missing VRZ Torment which if i recall has native Omni support doesn't it? we need more native support games in the list woot woot. Hi all, we've been talking to a lot of developers in the past few weeks and months, and many more games are on the way with native Omni support. We'll announce them as they become available! I'd add GZ3doom player for all the old Doom Hexen, etc. WAD files. Doom 2 plays great.